What Time of Year Do You Plant Pampas Grass? Will Pampas Grass Grow in Partial Sun? When to Prune Pampas Grass in Pennsylvania? How Low Should I Burn Pampas Grass? Pampas grass is a popular variety of ornamental grass that grows prolifically in many sunny landscapes. When pampas grass grows to its full size, it resembles a large fountain of thin grass blades with feathery fronds in the center. Choose a sunny location with rich soil for your pampas grass. Once the pampas grass is established, a gardener must trim the pampas grass each spring prior to the growing season. Wear long pants, long sleeves and gardening gloves while you work with the pampas grass because the grass blades can be irritating to exposed skin. The grass blades can also give a gardener cuts if the grass touches the skin during the trimming process. Kneel on the ground next to the pampas grass and prepare to trim the pampas grass. Grasp a handful of grass and reeds and trim the grass off at the desired height. Place the removed grass and reeds into the garbage bag. Continue to trim the pampas grass by grasping handfuls of reeds and grass the cutting them off. Work your way through the clump of grass from the outside perimeter of the plant toward the inside of the plant. Work until the entire plant is the desired height. 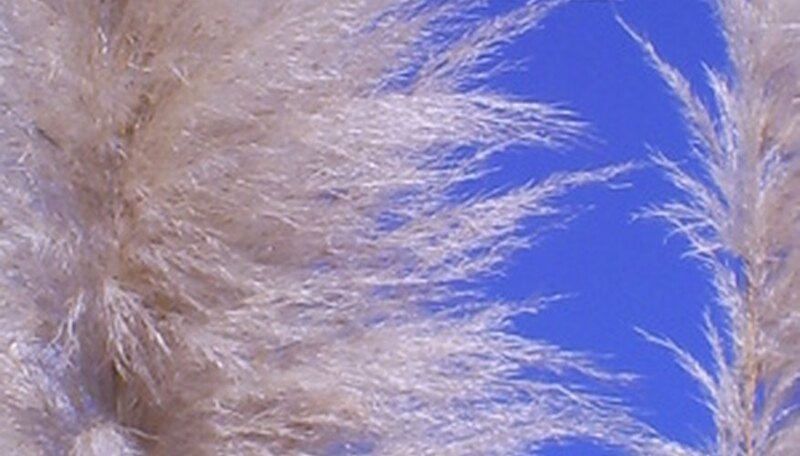 Cut pampas grass plumes in the fall when they are fully developed and dry. Choose plumes in perfect condition. Cut during the middle of the day, in dry weather. Cut about twice the number of plumes needed; plants will shrink a little as they dry and some will be damaged or unusable. Trim pampas grass plume to the desired height and arrange in a large vase filled with sand. Place in an area with good airflow. The dry pampas grass will continue to dry in the arrangement. Spray the seed heads with hairspray or an aerosol lacquer to give them strength and prevent them from falling off the stem as they age. Place a plastic tarp around the base of the cluster. The tarp protects the ground from dropped seeds while you are getting rid of the pampas grass. Put on protective clothing to prevent accidental injury from the sharp edges of the grass blades. Cut the pampas grass to the height of 2 to 3 feet using a pair of long-handled pruning shears. Make quick cutting strokes and allow the pampas grass to fall to the ground onto the tarp. Pick up the plastic tarp from the ground and dispose of the clippings by placing in plastic trash bags and depositing into a trash container. Clippings contain numerous seeds and should not be used in a home garden compost. Prepare a solution of 2 tablespoons of glysophate herbicide per 1 fluid ounce of mixing compound, such as water. Glysophate is a systemic used to kill the foliage and the root system of pampas grass. Spray the solution at the base of the pampas grass cluster. Spray additional solution on the remaining foliage. Wait approximately one week. Prepare another solution of glysophate herbicide. Prune the remaining pampas grass cluster to ground level. Spray the entire cluster with another application of the glysophate herbicide. As with most ornamental grasses, it is best to plant pampas grass in the spring so it has a chance to establish an adequate root structure before winter. Bundle the stalks of the pampas grass flowers together and tie with a piece of twine. Leave about a foot of twine hanging from the knot. Tie the other end of the twine around the center of a wire clothes hanger. Use another length of twine to secure it, if needed. 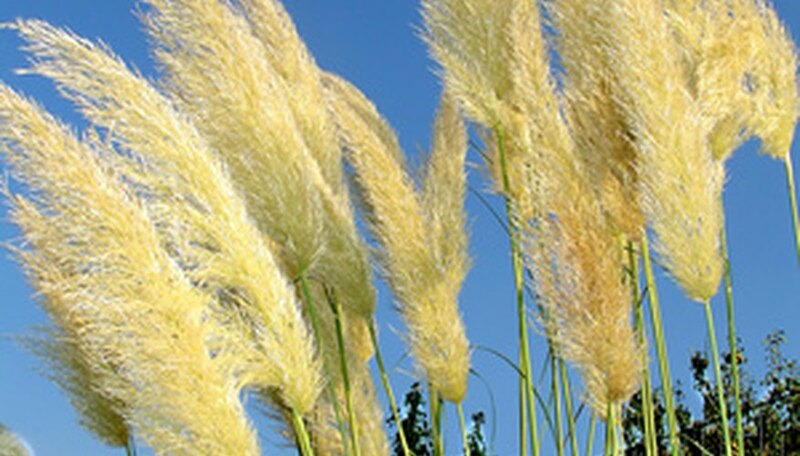 Spray the feathery, fluffy blossoms of the pampas grass stalks with hairspray. Make sure to hold the can about 4 inches from the flowers so as not to disturb the texture of the flowers. Allow the flowers to dry for 15 minutes. Then spray the remaining sides of the flowers. Hang the clothes hanger from a cabinet knob in your kitchen, or from a hanging plant hook. Allow the pampas grass flowers to hang dry for up to three days. Cut back the fronds of the pampas grass before applying Roundup. Use the hedge trimmers to cut the foliage back to approximately 8 to 12 inches above the soil level. Dispose of the fronds in a large garbage bag. Apply the Roundup to the remaining pampas grass growth. Saturate the fronds completely and generously as well and the crown area at the base of the plant. Cover the sprayed pampas grass with the plastic tarp. Spread the plastic over the entire clump of pampas grass and secure the tarp with rocks or bricks to keep it from moving. Leave the plastic in place for at least a month (longer if desired). Remove the plastic when the pampas grass is visibly dead. Dig out the pampas grass remains and dispose of them in a garbage bag (do not compost). Inspect the area around the base of the pampas grass. Remove any rocks, sticks and other debris that could get caught in the shears. Use the hedge shears to cut off all the leaves. Trim to a level that is a couple of inches above the ground. Fertilize after pruning to help the plant create new leaves in the spring. The University of Georgia Extension suggests using one with a 10-10-10 formula, which will supply all three major plant nutrients needed. Pampas grass (Cortaderia selloana) is a variety of ornamental grass that grows best in full sun to light shade. It grows 6 to 10 feet, creating a commanding presence to the landscape. Plant pink pampas grass where the plant will be exposed to direct sunlight for a minimum of a six hours a day. Water pink pampas grass occasionally during extended hot, dry weather. 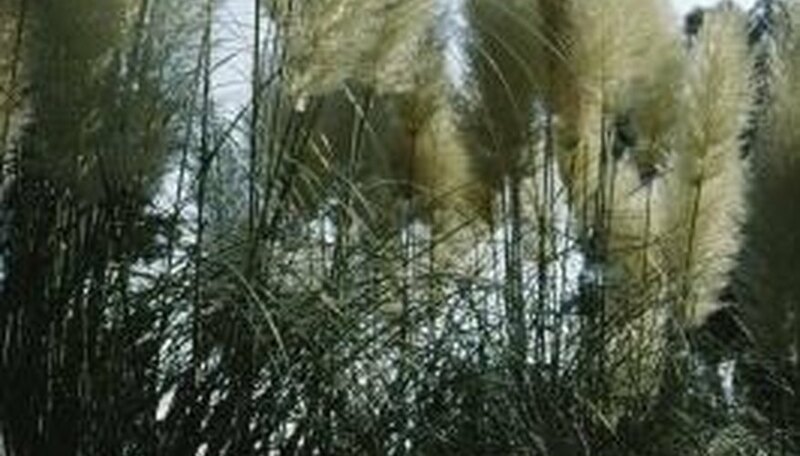 Otherwise, pampas grass is drought-tolerant and requires no irrigation. Prune pink pampas grass down to the ground in late winter before new growth emerges. Use hedge pruners, power pruners or a chain saw. Fertilize pink pampas grass after the spring pruning, using an all-purpose, balanced granular fertilizer. Read the package label for specific rates of application. Prune pampas grass (Cortaderia selloana) close to ground level during late winter in Pennsylvania before the spring growing season. Choose cold hardy pampas grass cultivars suitable up to USDA zone 5b, where temperatures drop to -15 to -10 degrees Fahrenheit. Based on your region's climate, plan on cutting back or burning pampas grass in mid to late winter. Do it early enough so there are no sprouts of new growth already coming up from the roots through the dried thatch in the grass clump. Burn the dried grass stems and sheaths back to height between 6 and 12 inches. You may find that the pampas grass doesn't burn evenly or perfectly. The high silica content in this grass, especially when moisture remains in stem bases, retards burning. Pampas grass clumps become quite large. Think twice about starting a fire on your property since the flames on a large grass clump will tower above the plant and potentially scald nearby plants or even catch lawn, debris or mulch on fire. Cut back upper foliage so the fire doesn't have as much fuel to grow large and hot.